The natural movement and functional power of the ankle and foot during a step , while appearing fairly simple, are amazingly difficult to replicate with a prosthetic. Usually it requires a fast and fairly powerful motor to provide the forward push and then whip that foot up as we pull our leg forward. However, recent projects have managed to do some amazing jobs at achieving this difficult task. Belgium’s Vrije Universiteit Brussel has released the video (below the break) of the “AMP-Foot 2.0” that pulls this off very well. The main idea behind the AMP-Foot 2.0 is to have the actuator work longer with a lower power rating while the produced energy is stored in elastic elements and released when needed for propulsion. The device is designed to provide 100% of push-off for a 75 kg subject walking at normal cadence on ground level. Love to see we’re finally getting somewhere with functional prosthetics! I notice a sudden shift in the rear of the picture a few times, so I guess this is a video that’s either looped a few times or cut together, and I wonder why. They don’t want you to see when the foot locks up and the guy bashes his head on the ground. 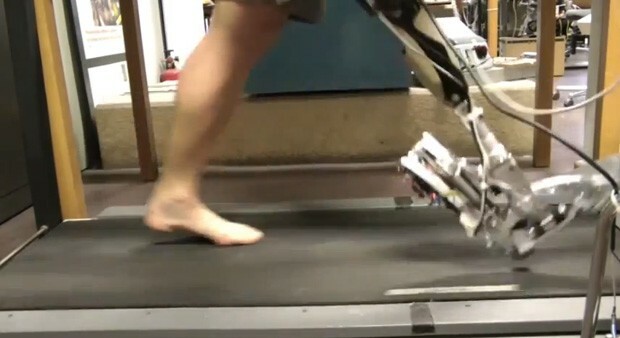 every time the dude stomps with the prosthetic, the whole treadmill shifts back a hair. Yeah, it does, but at 1:05, you see the black riser at the left of the video jump towards the right. Its looped. The treadmill resets after the skip. It’s a 20 or 21 second sequence looped multiple times. Also note the power cables, the thing takes too much power for the wearer to carry the power supply. What’s with having the toe plate flip up then down when the foot is brought forwards? Do you know more about this, or is your reasoning simply “it has a power cable” => “it must consume too much power for a battery”, which is a rather poor line of reasoning. In a lab you might want to add monitoring equipment and measure power consumption and all that fun stuff. A normal design process would be to first develop the prosthetic and add the battery at the very end. You’re not going to tell me that a modern Lithium battery isn’t strong enough to power that thing. And here I thought it was a tether. @Galane: Follow the link, it says it consumes only 30-60W; no problem for a battery pack. I’m wondering about the toe “flip” too, can’t tell if it’s intentional, or just a side effect of a freely-moving linkage. what!? Don’t you need a 6502 to build a terminator? Raspberry pie will not do, don’t put a pie to do the job of a 6502. Duoh, no hardware-multiplication => aiming a gun will take too long to shoot anything moving faster than a turtle..
Don’t forget there’s a neural networking processor in there too. A learning Computer. So I think it’s a combination of a 6502 and an FPGA that programs itself. This is amazing. I was surprised to see how the toes seem to snap upward during the forward step then the whole foot rolls downward on to the surface on the back step. It moves so smoothly. Within the firs five second of watching this video I actually said out loud “oh its a wrap we have cyborgs” This is beyond awesome!! I’m glad to be alive in this day and age. OldNick on Will Supercapacitors Ever Replace Batteries? Blake W. Ford has updated components for the project titled Wifi enabled Arduboy dev kit. Feri liked OpenWheel : parametric OSH wheels/tyres/tracks. Feri liked R.Hasika - a precise and compact robot base (rpi). ivan003003 liked Boson Frame Grabber. K.C. Lee wrote a comment on project log A quick one: copper-tape prototypes. Blake W. Ford has updated the project titled Wifi enabled Arduboy dev kit. Feri liked R.Ian, simple and easy built robot for education. K.C. Lee wrote a reply on project log A quick one: copper-tape prototypes. lanternfish liked A4988 Stepper Driver Duplicator.